Brian Solis, the esteemed author of The End of Business as Usual , speaks eloquently about two modern phenomena: ► disruptive technology, and ►digital Darwinism. Dacher Keltner, renowned psychologist at the Greater Good Science Center at the University of California in Berkeley, talks of another current of Darwinian thought: ►survival of the most empathic. Taken together, these notions can have significant influence on the way nonprofits do business. Disruptive technology means that, no matter what we do, the digital landscape is disturbing the status quo. There is no such thing as ‘business as usual’ any more, at least not if we want to stay in business. Because new technologies are separating us from our target markets. As Solisreminds us: “Your job is not to embrace new technology with arms wide open, but instead to understand it and learn which disruptive technologies separate you from existing and potential customers.” If our ‘peeps’ are on Facebook… Twitter… Pinterest…LinkedIn… you-name-it… and we’re not there in a meaningful way? Well… we’re out of the game. 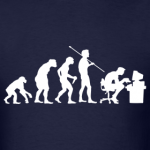 Which brings us to digital Darwinism and our need to adapt to survive. Continued existence and relevance in the era of digital Darwinism means we must be empathic. We must listen to our constituents and engage with them. We must cooperate. Really, it’s ever been thus. But somewhere along the line we lost our way a bit. The era of me, me, me… of Gordon Gecko and Enron and ‘greed is good’… that was neither kind nor good. And it brought these folks down. Ultimately, they failed to survive. The drive to join is deeply ingrained, a result of a complicated evolution that has led our species to a condition that biologists call eusociality. “Eu-,” of course, is a prefix meaning pleasant or good…. And the eusocial group contains multiple generations whose members perform altruistic acts, sometimes against their own personal interests, to benefit their group. Eusociality is an outgrowth of a new way of understanding evolution, which blends traditionally popular individual selection (based on individuals competing against each other) with group selection (based on competition among groups). Individual selection tends to favor selfish behavior. Group selection favors altruistic behavior and is responsible for the origin of the most advanced level of social behavior, that attained by ants, bees, termites–and humans. “Survival of the fittest” was not Darwin’s phrase, but Herbert Spencer’s and that of Social Darwinists who used Darwin to justify their wished-for superiority of different classes and races. “Survival of the kindest” better captures Darwin’s thinking about his own kind. When folks ‘share’ things with their social networks, isn’t this a pro-social behavior?Shouldn’t this be something we strive to tap into? A new book by David Amerland, The Social Media Mind, reminds us that social network platforms are tools (just like a website is just a tool) but they are not what social media is all about. Social media is an attitude. And many of us need an attitude adjustment. And when you consider it, isn’t it pretty anti-social to simply tweet some meaningless banality and call it a day? Businesses – whether for profit or nonprofit — must earn relevance by understanding their constituents, providing meaningful content and engaging with their tribes. This requires much more than adoption of the latest technologies or chasing the newest shiny object. Social media – not as a tool, but as an attitude — is a game changer. When will we accept the fact that the rules of the game have changed? Perhaps when we understand that the rules are now more in our favor. For we now have a way to go directly to the members of the groups who will be most disposed to care about our survival. And we can source unique insights from them to learn the very best ways to collaborate for the greater good. We are all social businesses now. Truly, this is remarkable. Once you listen, not monitor, but truly listen to customer activity and observe online behavior, you cannot help but feel both empathy and harmony. And naturally, the response it begets is only human. Empathy is perhaps the foremost survival skill of the current age. What will you do differently this month? P.S. I receive no revenue for telling you about the books and articles mentioned above. I just love to share. And this is provocative stuff.